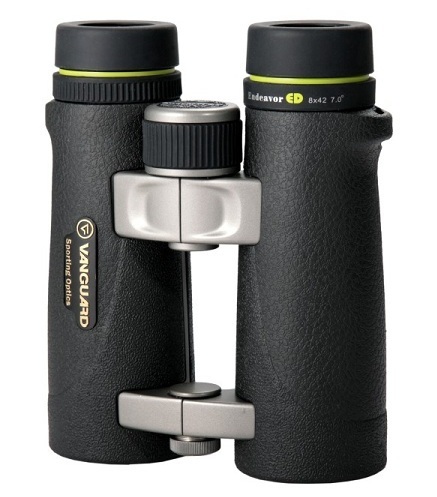 The Vanguard Endeavor ED 10x42 binoculars deliver sharpness and clarity like never before with exceptional light transmission and remarkable colour resolution and contrast. Featuring an ergonomic, open-bridge design for comfortable use, a wide view angle, BaK4 roof prisms, an anti-reflection coating, large focus adjustment wheel and long eye relief. The magic behind its performance lies in the premium ED glass, which reduces colour dispersion to provide high resolution colours and clarity. Vanguard Endeavor ED has BaK4 roof prisms and special lens coatings for unbelievable quality. Nitrogen-charged and o-ring sealed, the binoculars are waterproof and fogproof to take on challenging weather conditions. The Vanguard Endeavor ED 10x42 binoculars are supplied with carrying case, rainguard, tethered objective lens caps and strap and feature a limited lifetime manufacturers warranty.